Arup K Chatterjee was awarded his doctorate at the Center for English Studies, Jawaharlal Nehru University, in 2015; for his dissertation, "Hillmaking: Architecture and Literature from the Doon Valley." He has taught English, as Assistant Professor, at colleges in the University of Delhi. In 2014-15 he was a recipient of Charles Wallace fellowship to the United Kingdom. He is the founding-chief-editor of Coldnoon: International Journal of Travel Writing & Travelling Cultures. 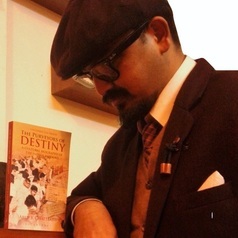 He is the author of The Purveyors of Destiny: A Cultural Biography of the Indian Railways (Bloomsbury, 2017). He is an Assistant Professor at the School of Law, O.P. Jindal Global University. He is currently engaged in writing a history of India, and a historical novel set in Edwardian India. His chief research and literary interests are British India, nineteenth century, the history of commodities and artifacts, and culture studies. Chatterjee received his first rejection letter at the age of sixteen from a publisher in Calcutta. It was letter written in calligraphy. Imitating the words of the letter he learned calligraphy. After three years later he went to Calcutta to meet the unknown benefactor. By then he had passed away.